Pho noodles are made from rice. They are flat in shape, white in color and smooth, soft and very slightly chewy in texture. You can find pho noodles in different sizes, from small to large, at Asian grocery stores. It is not common to use small pho noodles in Northern Vietnam. As someone from the North, I often use large pho noodles. I think it is worth mentioning that the noodles a lot of Vietnamese restaurants in the U.S. use to make pho noodle soups are not pho noodles. 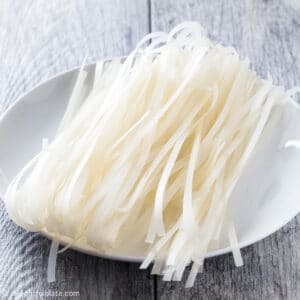 They are more like Chinese rice noodles, which are called hu tieu in Vietnamese. Pho can be used in noodle soups, stir-fry and noodle salad. You can find a lot of pho variations besides pho noodle soup in the North of Vietnam. In the South, pho is usually served as a noodle soup dish only. Asian grocery stores carry dried pho noodles of many brands. My favorite brand is Three Elephants. 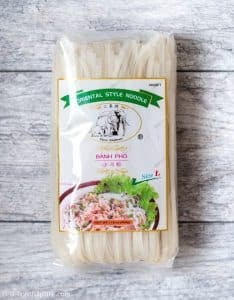 Their pho noodles, when prepared according to package instructions, have the texture that is the closest to the noodles in Vietnam. I also see fresh rice noodles at Asian grocery stores, but I have not tried it yet.